Why Do My Feet Hurt When I Jump? Workouts used to look very different. May you would stroll on the treadmill for 30 minutes; sometimes you’d opt for the elliptical or stair master instead. If you were feeling really ambitious, you might try out abs class or even join a running group. These days, HIIT (High Intensity Interval Training) workouts are all the rage. The theory is that, by alternating short bursts of extremely intense cardiovascular exercise with rest periods, the jumps in heart rate and the extreme exertion will jump-start your heart rate and metabolism, burning more calories than steady-state cardio. People also like HIIT workouts because you can spend less time in the gym with the same or greater calorie burning results. Many HIIT workouts incorporate some sort of jumping—whether it’s squat jumps, broad jumps or plain old jumping rope—instructors love to get your feet off the ground for some serious sweat equity in your workout. Jumping, especially with a jump rope, is an incredible exercise. It builds up your endurance and agility, all while strengthening the supporting muscles of your feet and calves. It even builds up toe strength—something high heel fans are bound to love. Lots of popular workouts call for bare feet, but jumping around without shoes can be damaging. If you’re determined to go barefoot during a jumping workout, make sure to stand on a padded mat to protect your feet from the full impact of the hard ground. If you’re jumping on mats and your feet still hurt, it’s time to slip on shoes—and not just any shoes. The shoes you select for high intensity workouts should be sneakers equipped with proper arch support. And if you’re already wearing supportive sneakers and your feet still hurt when you jump around, you may need to be fitted for an orthotic. That extra layer of custom-fitted arch support should put an end to impact-related foot pain during jumps. In some cases, your feet hurt when you jump because of inflammation in the ligaments that run from your heel to the back of your foot. Known as plantar fasciitis, this condition usually causes sharp pains in your heels, not in your arches. If this is your problem, you can’t just switch up your workout surface or shoes and hope for the best. 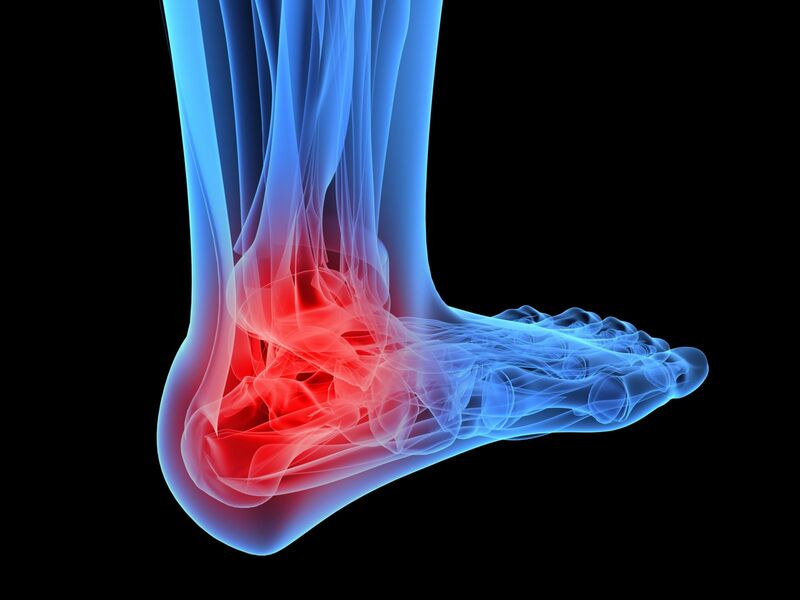 Plantar fasciitis is a chronic medical condition that can and will get worse without attention from your podiatrist. No matter how many precautions you take, jump-heavy workouts will take a certain toll on your feet. To prevent foot pain, make sure to try some of these recovery “cool-downs” after a workout. Ball Rolling – Just like you foam roll your larger muscle groups to release knots and tensions, you can do the same for your feet. Sit on a chair, feet flat on the ground, and place a hard, mid-sized ball (like a lacrosse ball) beneath one foot. Press down against the ball, making sure you apply enough pressure to give the muscles a good stretch. Grab a Towel– Hit the ground and put your feet straight out in front of you. Wrap a towel around your toes and pull it back toward your body until you feel a good stretch. Play around with the towel position until you get the right feel. Be the Dog – Learning to love yoga is great for your feet. While standing, reach your hands to your toes until you touch the ground (or get as close as your flexibility allows.) From there, walk your hands out to a comfortable position, where your arms and legs are both straight. Lift your rear end up to form a body-shaped triangle. Now that you are in “downward dog” begin pedaling out your heels, getting as close as you can to the ground to get a good stretch. Precautions are important with any workout, but they become even more crucial when you take on high-impact exercise. As always, if any of these measures still leave your feet hurting, stop your activity and check-in with your podiatrist to rule out an injury or chronic condition.